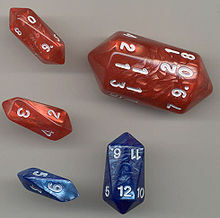 Long dice (sometimes oblong or stick dice) are dice, often roughly right prisms, designed to land on any of several marked lateral faces, but not either end. Landing on end may be rendered very rare simply by their small size relative to the faces, by the instability implicit in the height of the dice, and by rolling the long dice along their axes rather than tossing. Many long dice provide further insurance against landing on end by giving the ends a rounded or peaked shape, rendering such an outcome physically impossible (at least on a flat solid surface). Design advantages of long dice include being relatively easy to create fair dice with an odd number of faces, and (for four-faced dice) being easier to roll than tetrahedral d4 dice (as found in many role-playing games). 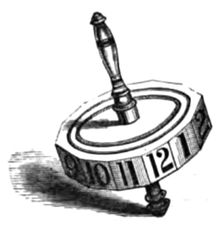 A four-faced Daldøs die, "unrolled" at right to show one of its standard configurations. Both cubic dice and four-faced long dice are found as early as the mid third millennium BCE at Indus Valley Civilisation sites; these are marked variously with dot-and-ring figures, linear devices, and Indus Valley signs. Dot-and-ring figures are used to this day on long dice in India, and predominate in the central European long dice shown above. In India, long dice (pasa) are used to play Chaupar (a relative of Pachisi); the faces may be marked with the values 1-3-4-6 or 1-2-5-6, though older Indian long dice were marked 1-2-3-4. Similar dice were used by Germanic people before the Migration Period. These include distinctive roughly ovoid Westerwanna-type dice (named for the site of their initial discovery in Lower Saxony); these are typically about 2 cm in length and marked with dot-and-ring figures of values 2-3-4-5. Long dice are used with the Scandinavian games Daldøs (typically marked A-II-III-IIII or X-II-III-IIII) and Sáhkku (with a variety of similar markings including X-II-III-[blank]); these dice may be so short as to exhibit nearly square faces, and therefore feature pyramidal ends. Five-faced long die for the Korean Game of Dignitaries; notches indicating values are cut into the edges, since in an odd-faced long die these land uppermost. A five-faced long die (pentagonal prism) is used in the Korean game of Dignitaries. Owzthat and similar forms of pencil cricket (a cricket simulation game) use two six-faced long dice (hexagonal prisms - like segments of a pencil). Though the traditional English Lang Larence ("Long Lawrence") was sometimes four-faced, it commonly appeared with eight faces (octagonal prism), even though they continued to display only four distinct values (each value being displayed on two faces). This gambling game played with the Lang Larence is the same as that usually played with teetotums. A teetotum is essentially a long die (though not necessarily physically long) with a spindle through its axis, allowing it to be spun and preventing it landing on end. 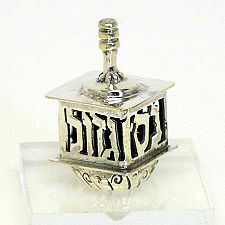 Though many teetotums (for example, the dreidel) are four-faced, they may have any practical number of faces. Barrel dice are a more recent design, used most often by players of role playing games and wargames. They appear roughly cylindrical, and are generally modified antiprisms with between three and twenty flattened triangular facets, each numbered. Each triangular face alternates in alignment by 180 degrees. The two ends are formed by half as many triangular facets as there are numbered faces, arranged as a pyramid so that it is impossible for the die to stop on one of its ends.